The HP 5400R zl2 Switch Series consists of advanced intelligent switches with resiliency and redundant management in the HP modular chassis product line, which includes 6-slot and 12-slot chassis and associated modules and bundles. The foundation for the switch series is a purpose-built, programmable 6th Generation HP Networking ASIC that allows the most demanding networking features, such as Quality of Service (QoS), advanced SDN functionality, and MACsec ready hardware. 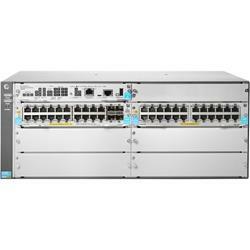 With HP Smart Rate multi-gigabit, gigabit, 10 gigabit and 40 gigabit Ethernet interfaces; choice of PoE+ and non-PoE, integrated Layer 3 features, and HP AllianceOne solutions, the 5400R zl2 switch series offers excellent investment protection, flexibility, and scalability, as well as ease of deployment, operation, and maintenance.